In this new post for the Indian Epics UnTextbook Report, I will try to sum up what it means to organize course readings that are driven by student choice, a system I am using in both of the Gen. Ed. Humanities classes that I teach, Myth-Folklore and Indian Epics. The goal is for students to explore readings that are of real value to them based on their personal interests and preferences. My role is no longer to decide on the readings for the whole class (i.e., the textbook) but instead to be a curator, selecting and presenting the reading options in a way that will help the students make good choices about what to read. That set of reading options is what I call "the UnTextbook." During the summer of 2014, I created an UnTextbook for my Myth-Folklore class, building 100 reading units arranged in 9 different modules (Classical, Biblical, Middle Eastern, Indian, Asian, African, Native American, British, European), resulting in literally trillions of possible combinations as the students choose their reading week by week. 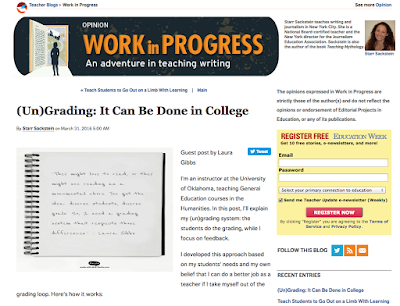 You can read about that project here: The UnTextbook: An OER Interview. I completed this project on my own time and, because of the abundance of public domain reading materials I could draw on, I was able to complete this project without any funding support from my school. An UnTextbook for Indian Epics Too! Despite those challenges, the success of the UnTextbook in Myth-Folklore made me determined to find a way to make this work. I decided that I could do this by using a mix of public domain materials online and books available for purchase in the Bookstore (the same books I had previously used as the required reading material). But things got even better: Stacy Zemke of the OER office in the OU Libraries urged me to apply for a $2500 grant to purchase additional materials that students could access in the Library. This was amazing: I was able to buy books, comic books, graphic novels, Kindle books and audiobooks, plus a film, all of which would be available to my students based on their reading choices. I got that grant just in time to dedicate the summer to this project. So, over the summer, I worked on Indian Epics ALL THE TIME (here's a timeline). Most importantly, I created my own "Public Domain Editions" of the Ramayana and of the Mahabharata (complete with audio), drawing on different public domain texts to create an anthology approach to each epic. That was a huge project for me, but really exciting, and I am looking forward to improving both epics based on feedback I am getting from the students this year. Then, as time allowed I also wrote up reading guides for the comic books and other reading materials, including some very detailed commentaries with links and images for students who wanted some extra guidance while they were reading. And that is just the beginning of what I want to do over the next couple of years; I love writing the detailed commentaries, and the students really use them, so it's just a matter of finding the time to write. Anyway, thanks to great help from Stacy and her assistant Cody Taylor managing the ordering and cataloging of the Library materials, I was able to create a first version of the UnTextbook for students to browse and choose from in time for Fall 2015. You can get an overview of the content by looking at the students' reading choices for the Ramayana part of the class in Weeks 2-3 and Week 4, the Mahabharata part of the class in Weeks 5-6 and Week 7, and then the free reading in Weeks 9-14. The results have been great: this was a class where many students struggled with the readings, especially with the Mahabharata. This semester, though, there is so much more engagement with both epics, and students are also exploring related topics like the Krishna legends and Buddhist storytelling traditions. Although it is still a difficult class (the topic is new, and there is a lot of reading), the difficulty is the good kind of difficulty, the type of challenge that can lead to real learning. Just as with the Myth-Folklore UnTextbook, there is some amazing math at work here: the number of combinations is astronomical. Based on their interests and preferences, students can choose from literally trillions of reading paths. And even if we just count "comic book" as an option (and not all the specific comic book combinations), then the numbers are still impressive: over 900 trillion combinations. Perhaps most importantly, even if students just limited themselves to the free public domain materials available online (which is what about half of the students in class have done), things still look really good: there are over 2 trillion combinations of the free online reading options. I'll confess to being completely uninterested in Big Data (unless you mean... Big Data), but I am very interested in giving students a big range of choices. The power of those choices becomes apparent from the combinations: week after week the combinatorial math results in trillions of paths, a big number that does justice to the unknown (and unknowable) range of interests that my students could bring to the class each semester. Let's call the students' range of interests potentially infinite; that means I really do need trillions of combinations to try to keep up with them. The downside of choices is the process of choice itself. I need to present these options in ways so that students are aware of all the options without being overwhelmed. This is a worthwhile challenge because, if I do this right, they will be learning about the subject matter through the act of choosing. 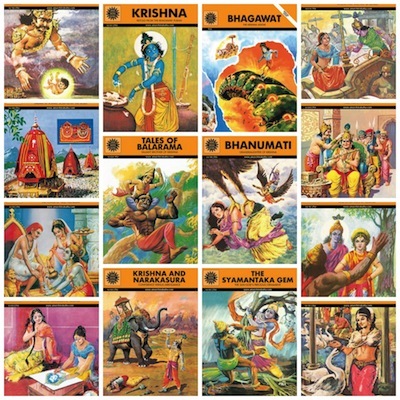 So, just to take one possible example, if a student reads through the Krishna comic books page, looking at the blurbs to find one or two comic books to read, they also get a sense of what the range of Krishna legends is like. In the next post, I'll write up a more detailed inventory of the ways in which I am presenting materials to students. I'm passionate about all these reading options (and the same goes for Myth-Folklore), which gives me the motivation to keep on experimenting and exploring. Even better: the enthusiasm might be infectious, as enthusiasm often is! Great update! I am glad some of the students are using the comic books - they are so beautiful.